It's Jake the Dog from Adventure Time! Tin tote showcases Jake's Stretchy Powers. Bring your loyal companion Jake with you wherever you go. Are you a fan of Adventure Time? Then of course you know Jake the Dog! He's the magical, shape-shifting best friend of Finn. Now he can be your loyal companion too with this totally mathematical Adventure Time Wrap Around Jake Tin Tote from Bif Bang Pow! The Adventure Time Wrap Around Jake Tin Tote features Jake's unique Stretchy Powers as he wraps his body around it. A trick sure to come in handy in your next adventure. The tin tote measures 8 5/8-inches wide x 6 3/4-inches tall x 4-inches deep. It's the perfect place to keep all your Adventure Time collectibles or maybe the Card Wars board game. 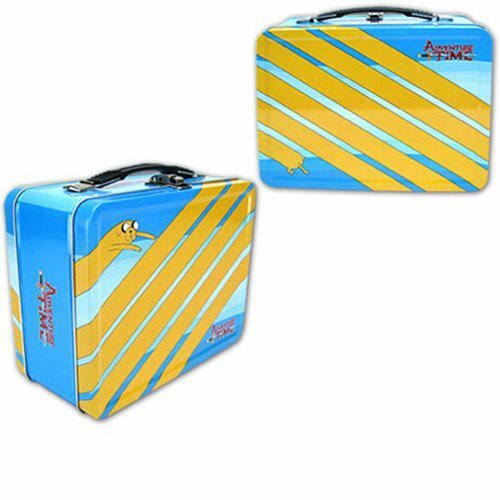 With Jake and this tin tote by your side the adventures will never end! Ages 14 and up.